Take advantage of this amazing, limited time sale. 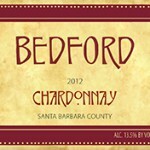 We are offering a 50% Case Discount (12+ bottles) on 2012 Chardonnay and 2012 Grenache. Purchase 6 to 11 bottles and receive a 30% Discount. Yes, you can mix and match the two wines for discount. Sale ends May 15. This entry was posted on Wednesday, May 9th, 2018 at 11:42 pm	and is filed under News & Updates. You can follow any responses to this entry through the RSS 2.0 feed. You can leave a response, or trackback from your own site.